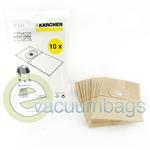 Karcher produces superb quality, high filtration 2-layer paper filter vacuum bags for their various vacuum cleaner models. These vacuum dust bags offer excellent filtering performance, durability and tensile strength. • NT 14/1 series vacuum cleaners. 2-Layered Paper Filter Vacuum Bags and Micro Filter for Kärcher Robocleaner RC3000 Vacuums. 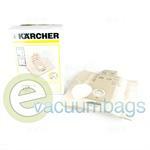 Paper Vacuum Bags for Karcher T 191 Commercial Dry Canister Vacuum Cleaner. 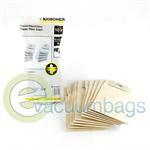 Type M Paper Vacuum Bags for Karcher Models T 7/1, T 9/1 Bp and T 10/1 Dry Canister Vacuums.